A classic science fiction novel by Ursula K. Le Guin, one of the greatest writers of the genre, set in a future world where one man’s dreams control the fate of humanity. "When I read The Lathe of Heaven as a young man, my mind was boggled; now when I read it, more than twenty-five years later, it breaks my heart. Only a great work of literature can bridge - so thrillingly - that impossible span." "A rare and powerful synthesis of poetry and science, reason and emotion." "Gracefully developed...extremely inventive.... What science fiction is supposed to do." "Profound. 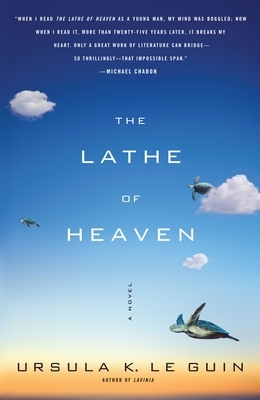 Beautifully wrought... [Le Guin's] perceptions of such matters as geopolitics, race, socialized medicine, and the patient-shrink relationship are razor sharp and more than a little cutting." "A very good book... A writer's writer, Ursula Le Guin brings reality itself to the proving ground."